Life in the Shoalhaven has been good to businessman Mark Emerton – who now gets paid for indulging his sporting passions. Mark has run his sports events management company Elite Energy Pty Ltd for the past seven years from a Bomaderry base. He also owns a bicycle shop in East Nowra, handy when both Mark and partner Elke, a full-time beauty therapist, are both keen cyclists, still competing in triathlons and other elite endurance events. The Royal Australian Navy brought Mark to the Shoalhaven soon after he enlisted in 1980. Born at Taree and finishing part of his secondary education at the Marist Brothers College, Lismore, Mark said he left in Year 12 to begin Naval training in Melbourne. After six months he was ready for transfer and was offered HMAS Albatross, Nowra. Feeling it was “just like Taree”, Mark decided “I’ll take that’’ – and he’s been in the Shoalhaven ever since. He credits the Navy with providing the business training, knowledge and experience followed by endless sporting opportunities upon which he has now based his businesses. His final role at HMAS Albatross was within the Royal Australian Navy Supply and Logistics Branch. While still in the Navy his triathlon activities and events organization abilities brought him to official notice in the lead up to the 2000 Sydney Olympic Games, and the Navy accommodatingly allowed him 12 months “leave without pay” to pursue an unforgettable adventure with the Olympic Games. As Mark tells the story, he began his event management portfolio in 1996, organizing the first Defence Force Triathlon at HMAS Creswell on Jervis Bay. He subsequently produced many other events from national and state championships to local club events and this culminated in Mark being offered and accepting the role as Logistics Manager to the Sydney 2000 Olympics Road Events. That involved managing the organization and conduct of men’s and women’s triathlons, race walks, marathon, road cycling and time trials - test events as well as the actual Olympics programs. This proved an unbelievable experience, Mark recalls, relating that he had about 400 section heads, volunteers and sections leaders in his team on duty during the Sydney Olympic marathon. He left the Navy in 2003 after 23 years and secured a three-year contract to produce the Australian and Oceania Triathlon Championships in the Shoalhaven at Huskisson. He built this event from 450 competitors in the first year to 2200 in the third year when he had 30 paid staff as well as 700 volunteers from within the Shoalhaven rostered for duty. That event, according to tourism officials, earned the Shoalhaven a $2 million windfall. Mark said the Navy launched him on his sporting career when it sent him as the official Navy competitor in the 1988 Hawaii Iron Man – the first of six Iron Man Triathlons he contested while in uniform. He now works under contract to Triathlon Australia and Triathlon NSW and currently produces three out of a possible four National Triathlon Championships - in Newcastle, Forster and Jervis Bay. In 2002 he ran the Australian Short Course Titles in Wollongong. Mark and his team were fortunate enough to be given the opportunity this year (2008) to produce the Wollongong leg of the National Weetbix Kids TRYathlon, considered to be the largest kids’ participation event in the Southern Hemisphere. Currently he has four full-time staff working with him on triathlon administration and covering such issues as traffic management, traffic control planning and liaison with organizations including Police, RTA and local government. Elite Energy Pty Ltd is now running 12 to 15 events a year within NSW and now Norfolk Island and the schedule is growing, having already reached what Mark describes as ‘’the comfort point.’’ He also sub-contracts for other events. Mark still competes at club level in events but is now concentrating on A-grade cycling. 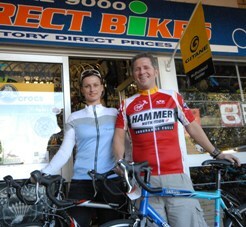 He supports and manages a number of elite athletes in addition to running his bike shop in East Nowra. ‘’It’s exciting that I’ve been able to turn a sport passion into a business – my sport in now my job,’’ he said. His partner, Elke also enjoys this passion for events and event management and competing in triathlons and cycling events. After leaving the Army after six years, Elke obtained a diploma in beauty therapy and is a senior therapist within a prominent Nowra salon.